The NEPAL EVO has the advantage of complete waterproofing and increased warmth - thanks to the Gore-tex and Duratherm lining. Crafted from 3.2 mm Irdo Perwanger rough out leather the NEPAL EVO will mold itself to your foot to boost your winter ice, alpine rock and all season mixed climbing power. 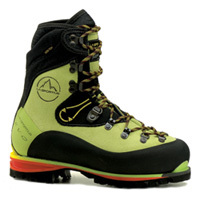 For greater efficiency and less fatigue the NEPAL EXTREME has a medium narrow last, deep heel pocket and slightly undercut sole to put your bones right over the "business" - the exact edge of the rubber sole or crampon points - depending on your climbing mode. This reduces the cantilever effect, boot rotation and the dreaded calf burn plus encourages a more natural feel - allowing you to achieve higher grades with less effort. 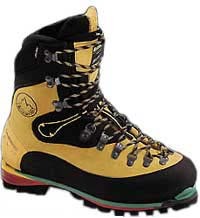 The NEPAL EVO sports a built in snow gaiter and 3D flex ankle system hinge - for ease of flat foot crampon technique and less strain. Also new is Vibrams IBS (Impact Brake System) sole with dual PU shock absorbers (under the heel and ball of foot) which soften impact and improve traction on both trail and technical terrain. WOMEN'S NEPAL EVO GTX is lasted for an equally good fit and is lighter too - with scaled down components, including more flexible midsole for lighter weight climbers. Guaranteed fit with a faxed tracing of your bare foot! Made in Italy, delivered anywhere in North America.